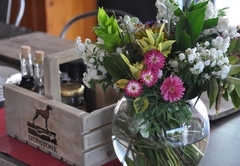 Dunstone Country House is a 4 star graded B&B offering Wellington accommodation in 6 guest rooms. 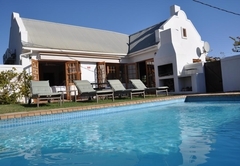 Ideally located, in the beautiful Bovlei valley, just 45 minutes from Cape Town. 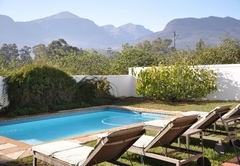 The estate lies at the foothills of the magnificent Limietberg and Hawequa mountains, which offer amazing views and create long hot summer days and cool evening breezes. 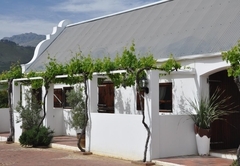 Six beautifully-appointed guest suites are the original Dunstone guest rooms; they are housed in the converted stables and a stable farm cottage. 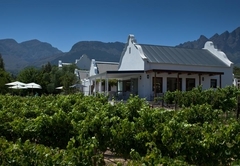 The rooms delight guests with stunning views of the mountains, vines and the farm. 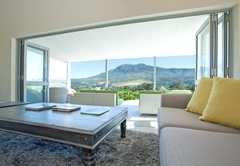 From your private entrance and veranda, enter a little home-away-from-home, with all modern comforts and all the extra touches for which Dunstone has become renowned. 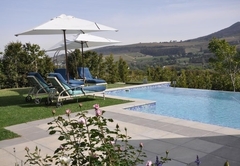 These enjoy the comfort of a beautiful guest lounge overlooking the mountains and vineyards with wrap around views and an infinity pool overlooking the vineyards and mountains beyond. 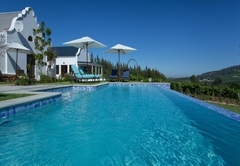 A beautiful guest lounge overlooking vineyards and mountains, with honesty bar and tea and coffee making facilities; 10m infinity swimming pool with luxury loungers; landscaped gardens including a herb garden, roses and lavender. 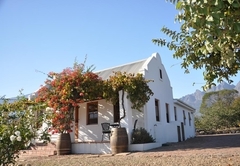 A self-catering cottage amongst the guava orchard, it boasts its own Viognier vineyard outside the front door. 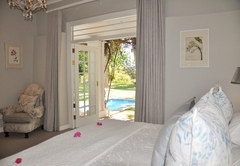 Guava has 2 King-sized bedrooms, a private garden and private heated swimming pool, fireplace and fully equipped kitchen. Guava can also be taken on a B&B basis. 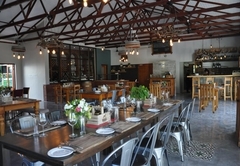 Enjoy breakfast in bed or at our winery bistro The Stone kitchen on Dunstone, sit amongst the wine tanks or under the shade of a tree in the gardens. Dinners and lunches are also on offer. 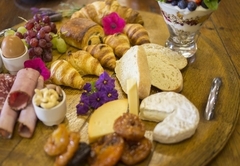 Full English and Continental breakfast with homemade delights is served between 08h30 and 11h00 We also offer pool snacks throughout the day, afternoon tea, wine tasting and nibbles at sunset and three course evening meals - booking essential. 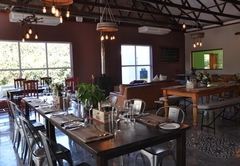 In addition to the facilities listed, we also offer off street vine shaded parking; free WiFi; DSTV hotel package; a fully licensed family Bistro restaurant; winery, cellar tours and wine tasting. 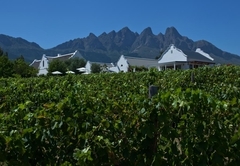 We have 10 hectares of beautiful far to explore, including vineyards and fruit orchards. 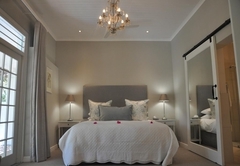 All rooms have air-conditioning with cooling and heating mode; fine cotton linen; goose down duvets and pillows; en-suite bathroom; high quality towels & bath robes; luxury amenities; hairdryer; large bar fridge with honesty bar, and snacks and tea tray with homemade lavender cookies. 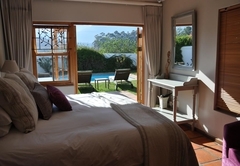 Rooms also boast a safe, iPod player, flat screen television with DSTV hotel package, DVD Player with USB port, and an in-house DVD library is also available. 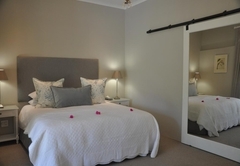 Chic and modern, A converted stable room with either twin beds or a king bed. This room is spacious enough to add a single mattress on the floor for children. 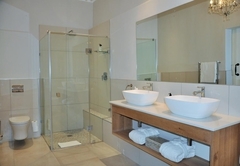 En-suite with a shower and bath. A converted stable room with either twin beds or a king bed. This room has a double sleeper couch for families with children sharing the room. En-suite with a shower and bath. 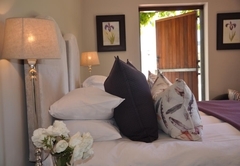 A cottage room overlooking the Lavender fields and Groenberg mountain. Romantic four poster bed with sensual fabrics and amorous white and silver furniture. 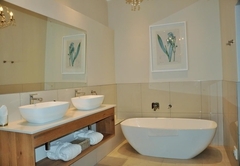 En-suite bathroom with overhead shower and marble tops. Private garden area with sun beds. A cottage room overlooking the herb garden. 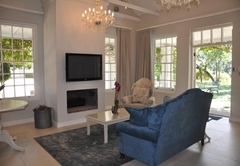 Colours of African clay and classic pine decorate this room. En-suite bathroom with overhead shower and marble tops. Patio area overlooking the mountains. Under-floor heating in bedroom. 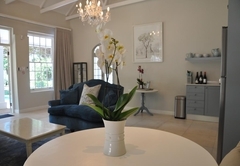 Acorn honeymoon cottage is a beautifully furnished one-bedroom cottage with a luxurious en-suite bathroom, a lounge with fireplace, kitchenette and dining area. 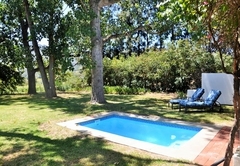 Garden and plunge pool in the Manor grounds. 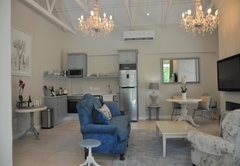 Enjoy on self catering or B&B. 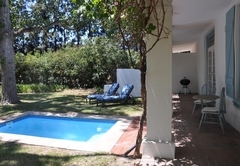 The most wonderfully relaxing guesthouse in all of the Cape. The location is amazing. The rooms are soooooo comfortable. The food is excellent. Abbi and her team offer the best service I have ever expeienced. 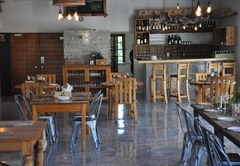 Bovlei Valley Reteat was recommended to me. I have stayed there on my last two visits to the Cape. 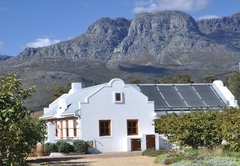 Now it is my opportunity recommend it..... simply a fabulous experience....... and their Dunstone wine is great! 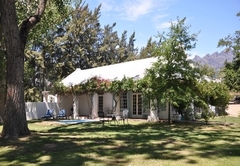 We had the most wonderful and romantic stay ever in Bovlei Valley Retreat. We felt as comfortable and luxurious as one can imagine. The family is very hearty and still descrete. Our engagment anniversary was celebrated with a wonderful and romantic dinner at the fire place all by ourselves. Abby herself cooked for us. 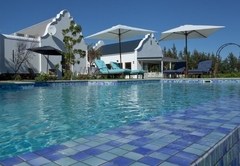 We were relly great to have had the chance to stay at Bovlei Valley Retreat because we felt really retreated! Thank you so much, we love to think back of this stay! Response timeDunstone Country House typically responds to requests in 5-10 minutes.